Greenland’s prime minister had flown to Beijing in 2017 and asked Chinese state-run banks to finance the new commercial airports, including a big one for one of the smallest capitals on earth, Nuuk, which can now be served only by propeller planes. The bankers were interested, people at the meetings said, so long as a Chinese company constructed the airports. When word of the incipient offer reached then-U.S. Defense Secretary Jim Mattis early last year, he called on Denmark—whose kingdom includes Greenland as a self-governing territory but whose government had been reluctant to fund the airports. Beijing must not be allowed to militarize this stretch of the Arctic, Mr. Mattis told his Danish counterpart Claus Frederiksen at a meeting in Washington in May, according to officials close to the discussion. 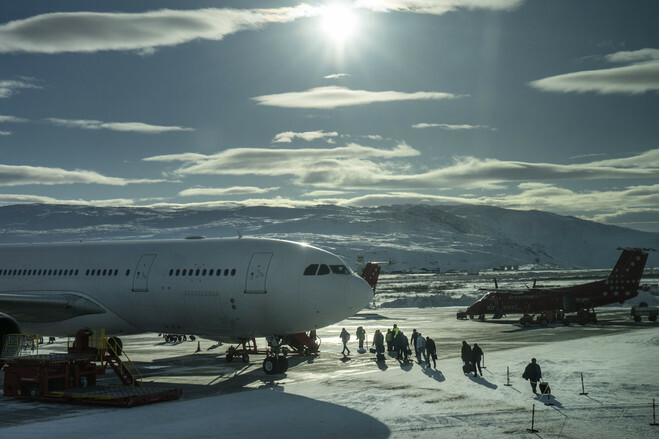 People boarding an Air Greenland jet bound for Copenhagen at Kangerlussuaq airport, the only air strip in Greenland that can accommodate large jet aircraft. For years, the U.S. and Europe had generally been spectators to a global Chinese building spree. To forge new global trade and infrastructure links, Chinese banks have been financing hundreds of projects, mostly built by Chinese companies, including roads, railways, pipelines and power plants. Western governments have been less willing to lend taxpayers’ money for risky infrastructure in distant lands. But that reluctance is ebbing as the geopolitical fallout emerges from the financial difficulties several countries face from Chinese infrastructure loans. In one notable case, Sri Lanka, unable to service a Chinese loan, granted a Chinese company a 99-year lease on a port close to key Indian Ocean shipping lanes. Alarmed, the U.S. is joining with allies to offer alternative sources of infrastructure financing. The sums involved are still dwarfed by China’s plans, but in July, the U.S., Japan and Australia announced a partnership to invest in infrastructure in the Indo-Pacific region. The European Union unveiled similar plans in October. Pentagon officials expressed worry that Greenland’s aid-dependent government could struggle to repay a loan for the $555 million project, and after a few missed payments, China’s government could take control of runways that could potentially be used by warplanes on an island where the U.S. has a missile-tracking air force base. A presence in Greenland could also help China access new shipping lanes and resources under the Arctic’s retreating ice. Months later, after the airports question precipitated a collapse of this polar island’s government and serial visits by U.S. and Danish officials, Greenland announced that its new capital airport would be built with loans backed by the Danish government, as would another 400 miles up the coast. Greenland will finance the third facility, and no role for China is foreseen. In an unusual step, the U.S. Defense Department has offered to chip in with airport infrastructure that would help both civilian and military or surveillance planes land on the country’s coast. Greenlandic officials say they hope the airports will open up one of the world’s most inaccessible places, allowing in affordable flights bearing tourists, repatriates and immigrants. U.S. officials see the episode as demonstrating one model for countering China’s global ambitions: calling on old allies to engage in places where Beijing’s ascent is challenging American power. “When you have an issue like this arise, you see the strength of those alliance relationships,” a senior Defense Department official said. Oqaatsut, a small village of about 30 inhabitants, faces an existential question of survival as the younger generation leaves for larger towns in Greenland. The Chinese foreign ministry didn’t respond to requests for comment on the airport project but in a statement said China had good relations with Greenland and Denmark, adding that it encouraged Chinese companies to help Arctic development. A former colony of Denmark, which granted it limited self-rule in 2009, Greenland doesn’t have roads between its cities. Residents move around using a network of domestic airstrips and helipads that stretches back to World War II. 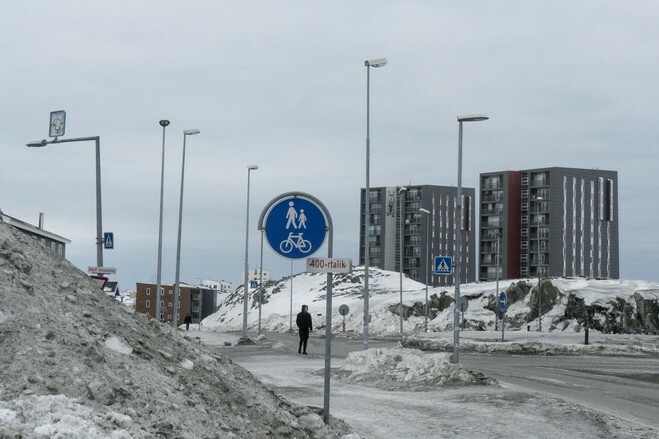 Street signs in Nuuk, Greenland’s capital and largest city. Residents of the world’s largest island depend on a World War II-era network of airstrips and helipads to get around. 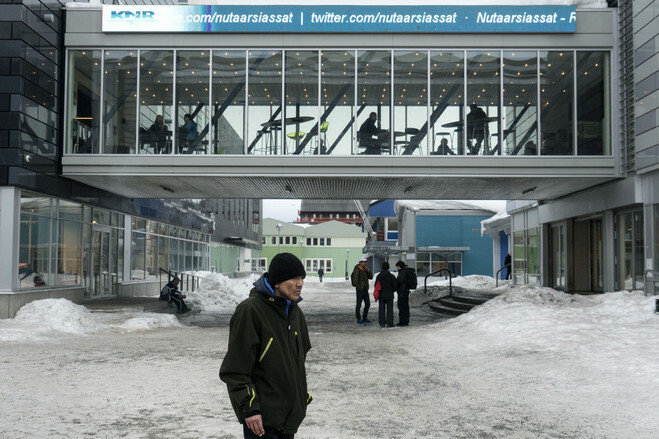 Danish Prime Minister Lars Lokke Rasmussen repeatedly turned down requests to lend money for international airports on the island, Greenlandic officials say. After last year’s meeting between Mr. Mattis and Denmark’s defense minister, however, Mr. Rasmussen’s government rapidly pulled together a funding package that Greenlanders found surprisingly favorable. “He was not into it at all—until the Chinese showed interest,” said Aleqa Hammon, Greenland’s former prime minister, speaking of Mr. Rasmussen. Mr. Rasmussen’s office declined to comment. Copenhagen’s volte-face is a measure of how China’s economic and military rise is intensifying international competition over the Arctic, especially Greenland, whose tiny government is slowly moving toward independence from Denmark. China declared itself a “near-Arctic state” last year, outlining plans to carve new shipping routes through the region’s melting ice and exploit the natural resources underneath. In 2016, a Chinese government-owned company tried to buy an abandoned naval base in Greenland; Denmark sent four sailors to live there and shoo away Chinese interest. Chinese firms hold a stake in uranium and rare-earth mines on the island, and a state-owned university recently announced it would build a polar research antenna here. The airport contest kicked off with a series of meetings in Beijing in November 2017 between Greenland’s government and Chinese banks. Denmark, eager to appear supportive of Greenlandic sovereignty, had helped arrange the meetings, including with China Development Bank and the Export Import Bank of China. Downtown Nuuk. 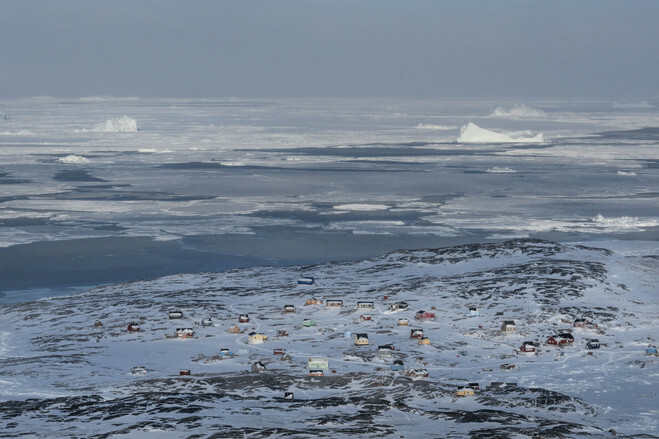 Greenland's population is becoming more and more urbanized, as more people leave a traditional lifestyle and move to the city, which now has about 17,500 inhabitants. The banks seemed to know little about Greenland, said Johannus Egholm Hansen, board chairman of Greenland’s state-owned Kalaallit Airports company, who attended those meetings. “It was early days,” he said. The banks didn’t respond to requests for comment. Denmark undertook to buy equity and guarantee loans at a roughly 1% interest rate. Greenland’s government expected to spend up to quadruple that in borrowing costs. The savings will cut $130 from the price of a round-trip ticket from Europe to one of the world’s most unreachable islands, flag carrier Air Greenland estimates. “This is an investment in national security, an investment to make sure we can stay on a good foot with the United States,“ said retired Adm. Nils Wang, a former head of the Danish navy and an expert on Arctic security affairs. Not everyone in Greenland has been pleased about the reassertion of Western power in the Arctic. As the terms of the new deal emerged in September, the government of Prime Minister Kim Kielsen collapsed and Parliament launched into months of arguments. Pacifists expressed their continued mistrust of the U.S. military, which once secretly started construction on a nuclear-missile base here. Many lawmakers said they disliked the influence Denmark would gain over the new airports, and a pilot in the legislature quarreled over the technical specifications of the runways. Finally, in November, exhausted lawmakers approved the project. 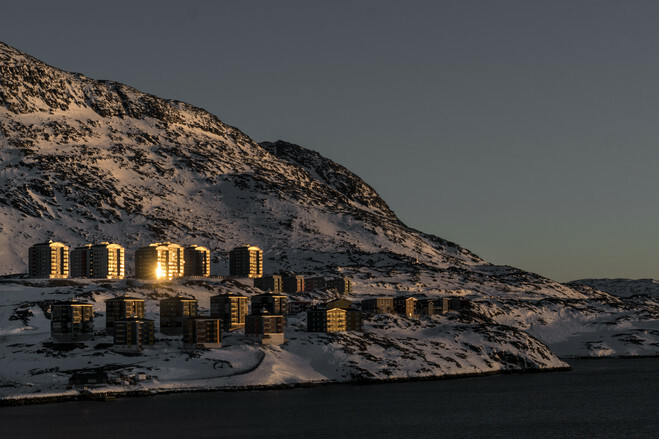 Newer apartment buildings in Nuuk catch the last rays of Greenland’s sunset. —Bingyan Wang in Beijing contributed to this article.